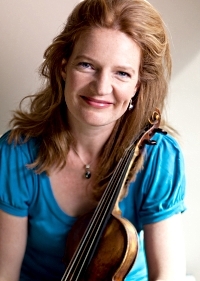 This March, Philharmonia Baroque Orchestra - hailed by the New York Times as the nation's leading period-instrument ensemble - welcomes violin virtuoso Rachel Podger for a program of nine popular Vivaldi violin concertos featuring soloists from the Orchestra alongside the acclaimed British violinist. Four performances take place around the San Francisco Bay Area at Stanford's Bing Concert Hall, (Wednesday, March 11), the SFJAZZ Center in San Francisco (Friday, March 13), and First Congregational Church in Berkeley, CA (Saturday and Sunday, March 14 and 15). Tickets are available through City Box Office and start at $25. This concert includes some of Vivaldi's most popular concertos from La cetra, La stravaganza, and L'estro armonico. Among the best-known is the Concerto for Two Violins, No. 8 in A minor, RV 522, in which Podger is joined by Philharmonia co-concertmaster, Elizabeth Blumenstock. Other concertos on the program showcase sparkling soloists from the Orchestra including violinists Carla Moore, Katherine Kyme, Lisa Weiss, Jolianne von Einem, and cellist Phoebe Carrai. At Podger's debut with Philharmonia in 2013, one critic described the evening's program - which featured Vivaldi as well as Corelli, Pergolesi, Mossi, and Locatelli - as "a friendly gathering of colleagues all assembled for the joy of music-making." "A Celebration of Peace Through Music" is a special televised concert created by American conductor Sir Gilbert Levine that took place on May 5, 2014 in Washington, D.C. The concert features the Krakow Philharmonic Choir, the Orchestra of St. Luke's, and the Washington Choral Arts Society. Through music, a language that supersedes all cultural boundaries, Levine leads these world-class vocal and orchestral ensembles in a moving tribute to Pope John XXIII, Pope John Paul II and Pope Francis, three spiritual leaders recognized for their devotion to promoting understanding and peace around the world. "A Celebration of Peace Through Music" is a two-hour show that will be broadcast on public media stations nationwide in Spring 2015, particularly around Easter 2015, Sunday, April 5. A world-renowned conductor, Levine has been a major presence on Public Television, leading the U.S. television debuts of some of the most important orchestras world-wide. Known as the Pope's Maestro for his decades long friendship with Pope John Paul II, Sir Gilbert is uniquely qualified to lead this musical tribute. "A Celebration of Peace Through Music" is a celebration of music and spirit, open to people of all faiths. Conducted by Levine, the concert honors the canonizations of Pope John XXIII and Pope John Paul II, in the spirit of Pope Francis. Each musical work performed was selected to reflect the spirit of these three great leaders and their commitment to peace and understanding among people of all faiths. This concert special also follows Sir Gilbert as he travels to Buenos Aires, Venice, Krakow, Rome, Vienna, and Washington, D.C., to show us all how music and spirit can unite our world. The concert, performed in Washington, D.C., in May 2014, following Pope Francis's ceremony to make Pope John XXIII and Pope John Paul II saints, was a joint effort by WETA Washington D.C., Georgetown University, the Archdiocese of Washington and the embassies of Poland, Italy, Argentina and the Holy See. The embassies represent the native countries of Pope John XXIII (Italy), Pope John Paul II (Poland) and Pope Francis (Argentina). The music program for "A Celebration of Peace Through Music" was specially selected to commemorate and celebrate historical moments of peace and understanding demonstrated by each pope. AOP Receives Opera America Grant to Commission New Opera, "To Kill That Bird"
American Opera Projects (AOP) is proud to announce it is the recipient of an OPERA America Female Commissioning Grant in support of a new double bill chamber opera by composer Wang Jie currently titled To Kill That Bird. The two one-act operas of To Kill That Bird are united by the theme of strong female artists contending against the oppressive bureaucracy of the Zodiac Animal overlords. AOP will begin workshops of the opera in 2015 through its First Chance program, which allows composers and librettists to hear their work in part or in full for the first time before an audience, with live singers and accompaniment. The production is slated to debut in 2017 at Festival Opera in Walnut Creek, CA, to be conducted by Festival Opera's longtime artistic director, Michael Morgan. First premiered in concert at Carnegie Hall in 2010 where it was called "by turns whimsical, campy, tragic, haunting" by The New Criterion, the first half of To Kill That Bird, the 30-minute "From the Other Sky," portrays the fable of how the thirteen animals of the Chinese Zodiac downsized to twelve. Experiencing human compassion for the first time, this thirteenth Zodiac Goddess loses her place in the heavens to share her musical powers with mankind. "From the Other Sky" was commissioned by American Composers Orchestra/Mr. Paul Underwood. The 70-minute second bill "From the Land Fallen" tantalizes the audience with a tragic and haunting transgender love story. New York City in a parallel universe, the Zodiac Animals rule the human world headed by the Rat. As human rebellion erupts, a war widow finds her late husband's spirit embodied in a deranged woman and falls in love with her. Scottsdale Center for the Performing Arts will present a St. Patrick's Day concert with The Chieftains on Tuesday, March 17, in the Virginia G. Piper Theater. The concert showcases the acclaimed Irish band's founder Paddy Moloney and special guests, including the Advanced Vocal Ensemble from Scottsdale's Saguaro High School. After more than 50 years of innovative music-making, The Chieftains are one of Ireland's most renowned and revered bands. The six-time Grammy Award-winning group has uncovered the wealth of traditional Irish music that has accumulated across the centuries, making the music their own with a style that is as exhilarating as it is definitive. The Chieftains were formed in Ireland in 1962 by Paddy Moloney, one of the country's top folk musicians. Although their early following was purely a folk audience, the range and variation of their music and accompanying musicians quickly captured a much broader following. The Chieftains are never afraid to shock purists and push musical boundaries, and the trappings of fame have not altered the band's devotion to their roots. They are as comfortable playing spontaneous Irish sessions as they are headlining a concert at Carnegie Hall. Tuesday, March 17, 2015, 7:30 p.m.
Young People's Chorus of New York City Makes Its Festival of the Arts Boca Debut Saturday, March 14, at 7:30 p.m. The award-winning Young People's Chorus of New York City makes its Festival of the Arts BOCA debut in Boca Raton, Florida, on Saturday March 14, with an exciting two-part program at the Mizner Park Amphitheater, which displays the range, vocal excellence, and showmanship of the award-winning chorus. The 7:30 p.m. concert opens with YPC Artistic Director/Founder Francisco J. Núñez conducting YPC in thrilling selections from the chorus's tour program. Following intermission, YPC joins the Festival Orchestra Boca and the Master Chorale of South Florida in what is considered Beethoven's greatest composition, Symphony No. 9 in D Minor, Op. 125 "Choral," conducted by Constantine Kitsopoulos. The first half of the program displays the ability of the YPC choristers to move from pure classical to folk and contemporary music, employing a variety of vocal techniques in quick succession, while at the same time executing complex choreographic moves.The set ranges from works by Robert Schumann and Leonard Bernstein, to a dramatic performance of a native song from Brazil, and Americana from Stephen Foster and Paul Simon. Est. in 2007, FAYM is 501(c)(3) charity dedicated to providing instruction, scholarships & career assistance for musicians to age 26. FAYM's "Violins for Kids" project (est. in 2009) provides two to three lessons a week, instruments, materials, field trips, and a 2-week summer camp for youngsters from low income families at no charge. Enrollment has grown from 15 to 120 with plans to add 40 more students in March 2015. All administrative functions are performed by highly qualified volunteers. Only FAYM's teachers are paid. All legal, accounting, and other services are generously donated 'pro bono' by experts in their fields. Your contribution will go entirely for programs and scholarship assistance for deserving and underserved young musicians. Please help further the cause by joining the Family of FAYM today! At the March 2 Young People's Chorus of New York City gala guest artist Allison Blackwell will sing "Life is a Bowl of Cherries" with the young singers of YPC and The New York Pops. "I picked 'Life is a Bowl of Cherries,'" she said, "because it is a song that celebrates, love, joy, perseverance, and faith. These are all things that music has given my life." "My support for the Young People's Chorus of New York City tells the world that choral music is a life-changing art form that is worthy of being celebrated." Allison likes to quote the words of composer, author, and educator Cheryl Lavender who wrote: "The fact that children can make beautiful music is less significant than the fact that music can make beautiful children." AOP First Chance returns to the Manhattan School of Music for their annual Opera Index series New American Opera Previews, From Page to Stage with excerpts from Legendary, an opera-in-development by Joseph Rubinstein and Jason Kim. The afternoon will feature a panel discussion with the artists hosted by Midge Woolsey and performances from Encompass New Opera Theatre. 1985. New York City. Famed drag performer Dee Legendary embarks on a passionate love affair with Officer John, whose fascination with Dee takes an unexpected and dangerous turn. Inspired by a true story, Legendary is an opera about double lives and destructive desires set in the glory days of New York City's underground drag culture. The opera began development in AOP's Composers & the Voice program in 2013-2014. The esteemed Saint Petersburg State "Russian Ballet" will embark on a seven-city U.S. tour beginning in Milwaukee on Tuesday, March 31. Ten performances will showcase the classic fantasy ballet "Swan Lake," featuring the renowned music by Tchaikovsky and an impressive cast of some of the world's best dancers. The Saint Petersburg State "Russian Ballet" continues to captivate audiences worldwide, adhering to the signature aspects of Russian ballet as a whole: true expressivity, dramatic presentation and impeccable technical presentation. "We are thrilled to bring the Saint Petersburg 'Russian Ballet' to the U.S. and believe the audience will enjoy themselves," said Ernesto Texo with Texoart Cultural Productions. Saint Petersburg State "Russian Ballet" performers are graduates of Saint Petersburg's prestigious Vaganova Ballet Academy, founded in 1738, and continue to perform on the oldest stages in Saint Petersburg. Consistently delighting sold-out audiences worldwide with world-class dancers and dazzling costumes, the Saint Petersburg State "Russian Ballet" continues to make international touring a large part of its contribution to furthering Russian dance and culture. Created in 1990 by the family of professional ballet dancers, The Saint Petersburg State "Russian Ballet" dynasty is more than 100 years old. Artistic Director Alexander Bruskin is a former soloist of the famed Kirov Ballet, a former classmate of the renowned Mikhail Baryshnikov, and a former student of legendary ballet instructor Alexander Pushkin. The Saint Petersburg State "Russian Ballet" has successfully conducted more than 50 tours worldwide in countries including Japan, England, Ireland, Spain, the U.S., France and Germany among many others, and has participated in 10 international ballet festivals. Today, the repertoire includes such masterpieces as "Swan Lake," "Sleeping Beauty," "The Nutcracker" and "Don Quixote." Each ballet is performed in its original choreography, and the Saint Petersburg State "Russian Ballet" perceives its main mission to be the preservation of such choreographic authenticity. An Entire Canon of New Music - Long Yu Announces "Compose 20:20"
Maestro Long Yu has never been one to shy away from big ideas. Emerging from the barren years of China's Cultural Revolution, he set about founding a major orchestra, the China Philharmonic, which he still leads, alongside the Guanzhou Symphony, the Shanghai Symphony and two major music festivals - the Beijing Music Festival (which he also founded) and, his newest addition, the Shanghai MISA Festival (co-founded with Charles Dutoit). He also helped spearhead the establishment of the Shanghai Orchestra Academy, a partnership between the New York Philharmonic and Shanghai Symphony Orchestra, with collaboration from the Shanghai Conservatory of Music. And now comes an initiative which he calls, "one of the most important projects in my life." Nothing less than a grand attempt to present to China and to the West an entire canon of the other region's music. He has called it Compose 20:20. Buoyed by the great success of new commissions such as Qigang Chen's Joie Eternelle for trumpet and orchestra at last year's London Proms, and Ye Xiaogang's "Imitation of an Old Poem: Long Autumn Night" from The Song of the Earth with the New York Philharmonic - as well as the new works he has brought to his Chinese orchestras in the past - Long Yu realized that there was a hunger on both sides for new music from across what he calls "the cultural bridge" between East and West. "More than a hunger," says Long Yu, "It is an absolute need, if we are to keep the cultural fires alive. We have seen so far a wonderful fascination in China for Western classical music, and the same coming the other way from the West. But this frenzy of energy has too often been somewhat diffuse and without shape. Now is the time that we can start using it to harness important thoughts, to explore and to experience in a curated way. New music especially needs this as it is hard for the individual work by itself to find an audience beyond its premiere these days." Launching the project last night was a performance with Yo Yo Ma, Wu Tong and the New York Philharmonic of Zhao Lin's Duo. The concerto, for cello and a Chinese woodwind instrument made from bamboo pipes called a sheng (to be played by Wu Tong), took place at the Philharmonic's annual Chinese New Year's Concert and Gala, at Avery Fisher Hall, which Long Yu conducted for the fourth consecutive season.